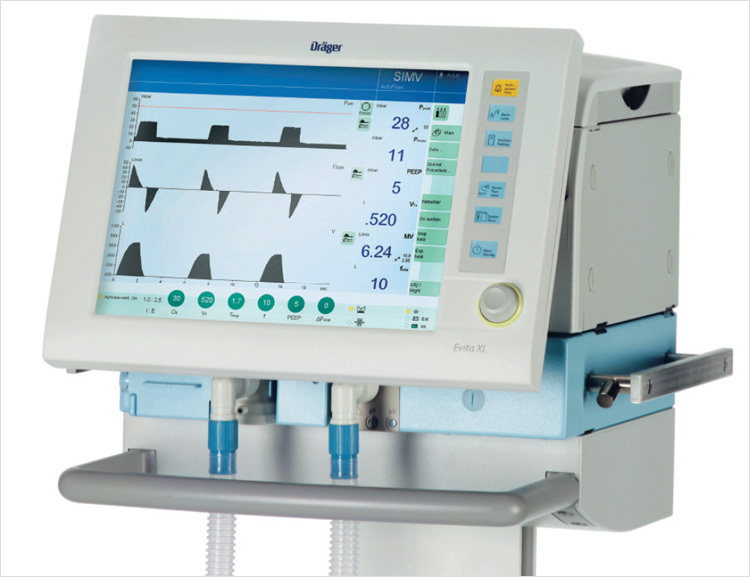 Save up to 80% on pre-owned Dräger Evita XL ventilators. The Dräger Evita® XL is designed to deliver a comprehensive array of both controlled and assisted ventilation modes. The Evita® XL combines a broad range of performance capabilities with many advanced application functionalities, providing outstanding ventilation therapy and easy-to-use operation encompassing the entire scope of the ventilation process. Features an advanced, dynamic leak compensation system that provides adaptive responsiveness and reliable tidal volume delivery. Standard AutoFlow® and BIPAP1) /PCV+, makes spontaneous breathing possible in any ventilation mode. Eases change to a stable breathing patient. The Lung Protection Package (LPP) provides you with a low flow P/V manoeuvre to identify optimal-PEEP and pressure settings for protective ventilation while special recruitment trends monitor the process. Integrated CO2 monitoring helps verify correct intubation and metabolic stability.